PHUKET: -- One of the men named responsible for organizing a red-shirt rally near Nai Yang Beach yesterday has denied any intent of establishing a “red-shirt village” in Phuket. The true aim was to determine how many people would protest against such a rally, said Surin Yotharak, a local village leader in Tambon Sakoo, the subdistrict immediately south of Phuket International Airport. “The red-shirt leaders wanted to see how many people would protest this rally. We have every right to hold rallies like this. The people who protested against us today say we are trying to incite conflict by holding it, but this is just an excuse,” Mr Surin told reporters yesterday after the rally, which attracted about 50 people. “We all think differently and have our own beliefs. Some people in Phuket agree with us holding this rally,” he added. 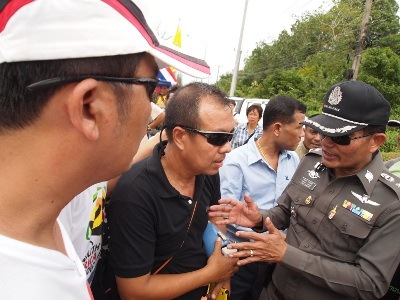 Mr Surin’s comments came after about 200 anti-red-shirt protesters removed a street blockade, at the request of senior police at the scene, at about 4pm to allow the red-shirt supporters to leave. 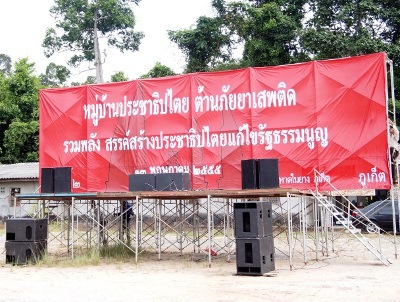 “There are no plans for us to establish a Red Shirt Village in Southern Thailand. The communities we want to establish are for the sake of democracy. We want our communities to be strong and immune to the drug problems that the government is focusing on,” Mr Surin said. Rumors circulating in the days leading up to the rally speculated that anywhere from 500 to 2,000 red-shirt supporters were to join the rally, many of them travelling from other provinces. Prominent red-shirt leaders such as Thida Thavornseth, Dr Weng Tochirakarn, Jatuporn Prompan and Kokaew Pikulthong were rumored to speak at the rally. However, none of them showed up. The red-shirt rally was organized in main two areas. Many supporters were to arrive at Nai Yang Beach in the morning, and then move to a stage set up down the road next to Thalang Technical College. The street blockade intended to stop red-shirt protestors from massing at the initial rally point on the beach. At the beach rally point, was Mr Surin’s brother, Sutha Yotharak. Mr Sutha supported his brother’s claim that the rumors of establishing a red-shirt village in Phuket were nothing more than misinformation. “In fact, the rally was called to address drug issues in the area. Red-shirt leaders were invited because they are part of the political system and might be able to help, because the government doesn’t seem to be able to stop the spread of drug use,” Mr Sutha said. Mr Sutha also asked expressly not to be reported as a red-shirt supporter. “In this, I am just a local villager,” he said. However, tensions throughout the day initially ran high, with police arriving in force to keep the crowds of supporters separated. Officers who had come to maintain the peace, and who had already searched the protesters for weapons, did not allow the protesters to cross into each other's areas for fear of a fight erupting. Protesters yelled at members of the red-shirt rally and demanded that they remove a sign that said “Democracy village fight against drugs, assembling for better democracy, amending the constitution” from their stage. Only after negotiating with Phuket Vice Governor Somkiet Sangkaosuttirak, Police Region 8 Deputy Commander Pisan Chuldilok, Phuket Provincial Police Commander Chonasit Wattanavrangkul and Thalang District Chief Naruenart Supattaraprateep, did the anti-red-shirt protestors agree to lift the blockade, but many maintained their presence at the junction. Some of the protesters left the area after the red-shirt supporters departed, but some remained in the Nai Yang Beach area until about 8pm. many things i do know but not all. Good let them stay away, they are not wanted .